Snowdon Volcanic Group towering over Llyn Peris. P007262. 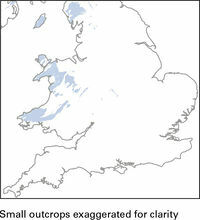 The Ordovician rocks are widely distributed occurring in the Lake District, the Isle of Man and Wales with scattered inliers across the West Midlands. The spectacular scenery that has attracted tourists, and artists such as William Turner, to the Lake District and Wales since the 18th century owes much to the diversity of the underlying rocks (Plate P007262). Tough volcanic and intrusive rocks contrast with sedimentary rocks that are softer and more easily weathered. During the Ordovician Period, the crustal block of Avalonia having rifted away from Gondwana drifted northwards towards the Equator. At the beginning of the Ordovician, England and Wales lay at about latitude 60ºS and at the end of the period at about 30ºS. This journey involved subduction of the ocean floor of Iapetus on the leading edge of Avalonia, and the opening of the Rheic Ocean between Avalonia and Gondwana (Figure P785799c). Subduction is associated with volcanism, and relicts of volcanic centres are preserved in most areas of Ordovician rock that we see in the UK today. Evidence of this new episode of volcanic activity is found at Rhobell Fawr, near Dolgellau in north Wales, where the Rhobell Volcanic Group (Olv) preserves the remnants of a very large volcano that erupted on land in late Tremadoc times. It marks the beginning of a volcanic episode that lasted a further 40 million years (well into the Caradoc) and also the end of deposition in a basin that had received more than 4000m of sediment over a period of 50 million years (Cambrian to Tremadoc). 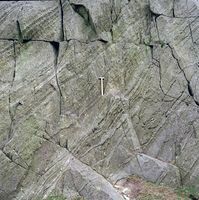 Tremadoc strata mark the final event in the infill of this basin. 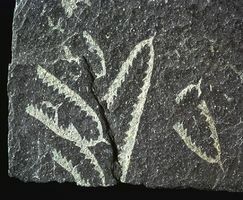 Early Tremadoc sedimentation patterns are similar to those that existed at the end of the Cambrian Period (e.g. Dol-cyn-afon Formation of Gwynedd). But change came in the late Tremadoc and at Shelve (O1), where the youngest Tremadoc rocks are preserved, there is evidence from both sedimentary strata and fauna that the depositional basin had become shallower and with restricted circulation. The base of the Arenig in Wales and the West Midlands is, in general, an unconformity that cuts across Tremadoc, Cambrian and Neoproterozoic rocks. The earliest Arenig strata (O2) are commonly shoreface deposits and mark a major transgressive event, for example the Stiperstone Quartzite of Shelve and the Garth Grit of Snowdonia. These are overlain by shallow-water bioturbated sandstones and mudstones — the Mytton Flags Formation at Shelve and the Allt Llwyd Formation in southern Snowdonia. Cross-bedding and soft sediment deformation in the Ogwen Group. P007442. 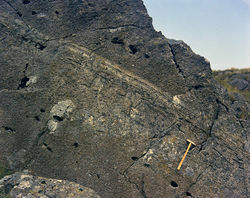 Bedded hyaloclastite, Aran Volcanic Group. P008228. 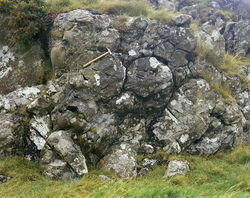 Pillow lava, Aran Volcanic Group, Gwynedd. P008226. Tuning-fork graptolite, Didymographtus murchisoni from the Llanvirn. P549553. Interleaved with the early Ordovician sandstones and mudstones are strata that were clearly derived from a volcanic source, including some of the sandstones of the Allt Llwyd Formation. These volcaniclastic sediments are reworked debris from volcanoes that erupted at some distance; all are part of the Ogwen Group (O2; O3; O4) that enclose and surround the volcanic rocks in north Wales (Plate P007442). Immediately to the east of Rhobell Fawr, lavas, tuffs and debris flows of the Aran Volcanic Group (Otf ; Plates P008228 and P008226) show that this area was once again overwhelmed by primary volcanic material during the Llanvirn and early Caradoc. To the north in Snowdonia, the main volcanic episode was later, occurring in the Caradoc as two major eruptive cycles, the Llewelyn Volcanic and Snowdon Volcanic groups (Otf ); together these are over 2200m thick and account for more than half the total thickness of Ordovician strata in that area. 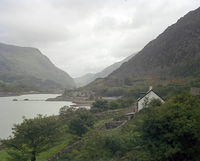 They rest on sandstone and mudstone of the Nant Ffrancon Subgroup (O3) part of the Ogwen Group and are overlain by the Conwy Mudstone Formation (O5). The volcanic rocks of Lleyn are coeval, and ash flow tuffs and lavas also occur to the east at Berwyn and Shelve. At Builth Wells the volcanic rocks (Otf ) rest on the Camnant Mudstone (O3). The volcanic activity occurred mainly in late Llanvirn to early Caradoc times. Ash-flow tuffs and mafic lavas formed temporary islands that shed debris into the adjacent sea. Some of this may have been transported and deposited nearby at Llandeilo. There, early Llanvirn black graptolitic mudstone (Plate P549553) that accumulated in relatively deep water is overlain by beach and intertidal sediments of the Ffairfach Group, which also contains abundant reworked lavas and tuffs that thicken north-east indicating a source from that direction. Overlying strata contain a rich fauna of trilobites and brachiopods, recording submergence of the volcanic landscape in a shallow sea. Farther north the strata indicate deposition in deeper water. These are fine-grained turbiditic beds and a large number of formations have been defined, which include the Llanfawr Mudstones (O3), StCynllo’s Church (O4), Nantmel Mudstone (O5), Ceiswyn, Nod Glas, Broad Vein and Narrow Vein—some of these horizons have been mined for slate. In Pembrokeshire, there is evidence too of early volcanic activity for andesite lavas (O ; Olv) are Tremadoc in age. The lavas were buried by nearshore sediments of the Ogof Hen Formation (O2) and the main volcanic event was in the late Arenig to Llanvirn, with eruption at a number of centres (Fishguard Volcanic Group; Otf). Thick debris-flow deposits were probably caused by rifting as well as the instability associated with contemporary volcanicity. Palaeogeographical sketch map of England and Wales during early to mid Ordovician. P785835. Gwna Group melange at Trwyn Maen Melyn, Lleyn Peninsula. P007928. On Anglesey, the Monian Supergroup (E3–O1) was deposited in a north-east-trending basin, separated from the main Welsh Basin by a landmass to the south-east (Figures P785834 and P785835); it comprises three main groups. The South Stack Group, which appears to be late Cambrian in age, is a turbidite fan system that spread out from land and shallow shelf to the south-east. The younger New Harbour Group is mainly metamorphosed mudstone with volcaniclastic sandstones, some thin beds of jasper, basalt and serpentinite, suggesting an andesitic island-arc setting. The Gwna Group (Plate P007928) completes this part of the sequence, and also occurs on Lleyn where it is separated from the Sarn Complex by the Lleyn Shear Zone and overlain unconformably by Arenig strata. The Gwna Group or melange is a massive thick olistostrome. It contains a chaotic mix of rock clasts that range from a few centimetres up to several kilometres across and consists of both oceanic and continental material that must have originated as rock slides and debris flows such as would be associated with major tectonic instability. An age of between 500 and 475Ma (late Cambrian to Arenig) is suggested for the supergroup. Resting unconformably on the Monian Supergroup are younger fossiliferous sandstones and conglomerates with thick-shelled coarsely ribbed brachiopods that suggest an inshore high-energy environment, but there is evidence of slumping and many were clearly transported from their original location. On Anglesey these beds are late Arenig (Fennian) in age. The Welsh Borderland Fault System — Pontesford–Linley and Church Stretton faults — persisted as the feature that separated the shallower area of the Midland Platform from the deeper water part of the Welsh Basin. On the Midland Platform (Figure P785835) thinner and less complete sequences are preserved, although Tremadoc rocks are widespread in the subsurface beneath the Midlands (Merevale Formation) and are known from seismic and borehole records to be very thick: up to 2000m underlies the Worcester Basin. There was a good supply of sediment during the Tremadoc, which was deposited in well oxygenated conditions, in marked contrast to the black mudstone that underlies them in most places. Latest Tremadoc, Arenig and later strata are generally absent. But at Lickey south-west of Birmingham, the outcrop includes possible Tremadoc volcaniclastic beds (Barnt Green Volcanic Formation) and the Lickey Quartzite that is possibly Arenig in age. At Caradoc in Shropshire, on the western margin of the platform, basalt with sandstone and siltstone of Caradoc age (O4) unconformably overlies Neoproterozoic and Cambrian rocks. Mudstone and siltstone couplets that are typical of the fine-grained strata of the Ordovician and Silurian: Cwmere Formation, Cambrian Mountains. P649396. The Manx Group (O1–3) of the Isle of Man is late Tremadoc to late Arenig in age, and is similar to the Skiddaw Group of the Lake District. In the Northern Fells, the Skiddaw Group (O1–3) consists of over 5000m of silty turbidites with intercalated sandstones (Watch Hill and Loweswater formations) of Tremadoc to Arenig age. These are separated from the Llanvirn sequence to the south (Central and Southern Fells) by the Causey Pike Fault and by the outcrop of the Buttermere Formation. The Buttermere Formation is an olistostrome, at least 1500m thick, and thought to have been emplaced by slumping towards the north, possibly during one stupendous event in the late Arenig. As with the Gwna Melange of Anglesey, blocks vary from centimetres to more that a kilometre across, and these olistostromes point to instability on the edge of Avalonia. The main volcanic episode in the Lake District started in the late Llanvirn, but is mainly Caradoc in age. The remnants of this major subaerial volcanic province are preserved as the Eycott Volcanic and Borrowdale Volcanic groups (Olv; Otf ) in rift basins to the north and south of the Skiddaw Group. They consist of basaltic, andesitic and rhyolitic lavas and intrusions; pyroclastic and volcaniclastic rocks form the upper part of the Borrowdale Group (6000m thick), which retains the evidence of caldera formation, and a large subvolcanic batholith was intruded at the close of the volcanic episode about 450Ma. Subduction-related volcanism, which also included the diorites and granodiorites of central and eastern England, ended in the late Caradoc, and the area was submerged once again as thermal energy dissipated. Fluvial and shallow marine clastic and carbonate sediments (Dent Group; O5) covered the volcanic terrain, and form the base of a thick foreland basin succession (Windermere Supergroup; S1–3) that was deposited during the late Ordovician and Silurian. Sedimentation in the Welsh Basin during the late Ordovician and early Silurian. P785836. During late Ashgill times a world-wide (eustatic) lowering of sea level is attributed to the growth of ice sheets on Gondwana. In the Welsh Basin this coincided with a marked increase in the rate of sediment supply: a thick wedge of turbidite mudstone built out westwards and is preserved around Llanilar, Rhayader and Builth Wells (O5). This includes the Yr Allt Formation that rests on the bioturbated Nantmel Mudstone Formation. Sediment instability, perhaps triggered by seismic activity along the basin margin faults, resulted in mass movement. Slumped, folded and destratified beds are characteristic of late Ordovician and Silurian deposition in the Welsh Basin (Figure P785836). Coarse-grained turbidites were deposited as lobes and in channels sourced from the shallower platform to the east. Late in the Ashgill, when sea level was at its lowest during the maximum glaciation, shallow-water shelly sand spread out across the fault-bound edge of the basin. 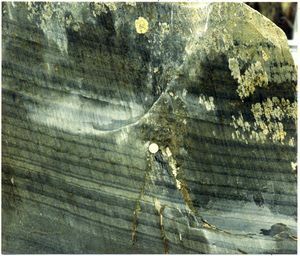 The succession records the effects of a series of marine transgressions and regressions, and alternating periods of oxic and anoxic (normal and very low oxygen) conditions, which are also apparent in the Silurian strata (Plate P649396).